Tumble outta bed and pour yourself a cup of ambition! A 9 To 5 remake is in early development stages at 20th century fox, according to Deadline, and the original cast are down for reprising their roles. It gets even better. Rashida Jones is in talks to co-write it. The story would follow a new group of girls who turn to Jane Fonda, Dolly Parton, and Lily Tomlin for advice handling the still ever prevalent sexism in the workplace. With the prominence of #MeToo, it’s clear this classic film is as relevant as ever, and we can’t wait to hear Dolly’s new rendition of the title song. Deadline reports that Kristen Wiig is the person most likely to play Cheetah, an enemy of Wonder Woman’s, in Wonder Woman 2. The sequel to the blockbuster, feminist power-anthem of a movie will be set in the Cold War, circa 1980s. A Cheetah vs. Wonder Woman movie will be even better, because the two most important characters will be women, and we’ll get to see their epic showdown. These two powerhouse, feminist badasses are bringing the amazing, feminist novel to the small screen in the form of a miniseries. The A.V. Club writes that Gurira is set to write, with Nyong’o starring. The Black Panther duo have had previous success with this arrangement: Gurira’s play Eclipsed earned both of them Tony Award nominations. A class-action lawsuit has been filed against Rick Butler, a prominent youth volleyball coach. Five women who were his students in the '80s say he raped them hundreds of times. BuzzFeed writes that a mother of a current student filed the lawsuit, because she would never have entrusted her daughter to his training had she known of past abuse. The Hollywood Reporter sat down for an anonymous chat with an Oscar voter. The promise of anonymity apparently prompted a super candid response to the question of who they would vote for as best actor. “This one was easy: Gary Oldman was so good that I don't care if he hit his wife with a telephone.” In 2001, Oldman’s then-wife Donya Fiorentino accused him of domestic abuse. Don't give up the fight! Featuring inspiring interviews with resistance leaders; how-tos on community organizing, running for office, and much, more. 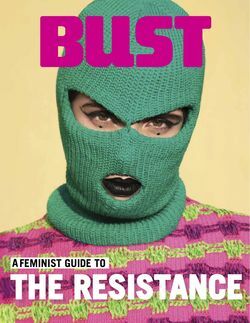 Plus, get the latest from BUST. The Supreme Court declined to hear a Trump appeal on DACA, effectively eliminating a March 5 deadline set by Congress to pass legislation that would protect those enrolled in DACA. The Deferred Action for Childhood Arrivals program will now run through fall, letting DREAMers avoid deportation until then, writes USA Today. Current enrollees can file to renew their two-year protection term. The Jane the Virgin and Annihilation star will appear later in this season of Brooklyn Nine-Nine, hopefully as girlfriend to the tough-as-nails Detective Rosa Diaz (Stephanie Beatriz). Vulture says we’ll probably be getting more queer representation after Diaz came out as bi earlier this season (Beatriz is bi irl, too), and we can’t wait to see where these two amazing ladies will go with it.